Intern at a theatre, opera house, dance studio, or other performing arts organization in Florence…the birthplace of opera and a mecca of Italy’s artistic life. Spend six weeks or longer living in the center of Florence and interning at a performing arts organization. You will join other PAA interns and students on program excursions and activities, and will take a three-week Italian language course customized to your current level. While you may have the opportunity to train and/or perform while interning at your company (depending on your skill level and Italian language level), many interns spend the majority of their time helping with the logistics of running the organization and gaining valuable insight into the inner workings of an international arts company. This could involve marketing and promotion, helping to teach classes, assisting with stage duties during shows, attending rehearsals, selling tickets, or any other number of tasks. Your internship is managed by Performing Arts Abroad in conjunction with a university in Florence, and thus you will enjoy student privileges, such as a meal plan, gym access, library card, and more, all included in the price of the program. Cinema Odeon Firenze is an elaborately designed theatre in Florence inaugurated in 1922. Here you can find English film screenings along with Italian films. The cinema hosts events as well as film screenings, including the British 100 Film Festival. The Florence Dance Center was founded in 1987 with the objective to create and bring to life the full experience of a multi-purpose center for the art of dance open to a wide audience, while also offering a socio-cultural reference point. The center offers dance courses in ballet, modern, contemporary, jazz, and flamenco. Teatro Argentina is a theatre in Rome inaugurated in 1732. The theatre’s mission is to give space to the dramaturgical research, valuing the new proposals, hosting the great interpreters of the Italian scene. Performances include plays, music, and dance by Italian and international artists. The Centrale Montemartini is a museum that may not be the first stop for Rome visitors looking for music and dance events. Once a year Centrale Montemartini along with several other museums in Rome play host for the “Museums in Music” music and dance event. Rome’s Beba do Samba is a music venue that hosts local rock bands. This bar and venue with an intimate and friendly atmosphere was born as a Brazilian-style bar but now offers a range of concerts from jazz punk to folk to nights for Italian singer/songwriters. Rome’s Silvano Toti Globe Theatre is based off the famous Globe Theatre of London. The open-air theatre houses Shakespearian plays offering standard sitting space for performances as well as the traditional standing space in front of the stage. Plays are staged every day except Mondays and tickets range from 11 to 28 Euros. This tucked away music venue for local jazz and blues bands, Argot is a weekend spot for music lovers. Saturday night is “piano and voice” themed the restaurant’s pianist runs the night with different international voices and Friday night is open to diverse artists new and old. The NoF Club in the Oltrarno area of Florence opened in 2011 is a popular local band venue. Bands perform from an AstroTurf stage in the shop-front window overlooking Borgo San Frediano. There is a second bar beneath wrought iron fixtures and leafy plant life. The venue hosts live music six nights a week, music starting from 10pm with free entry. The Alfieri Space is a creative theatre venue in Florence that houses cultural events such as plays, film, music, and visual arts. The Alfieri Space theatre houses performances ranging from works of local playwrights to Shakespeare. Film opportunities in the Alfieri Space include festivals year-round. Past festivals have been the annual International Documentary Film Festival and the Sea Film Festival of 2017. Cinema La Compagnia is a cinema in Florence built in 1921 and renovated most recently in 1987. The cinema houses excellent technical equipment that allows accommodation for many different activities: 35m me 4K digital projection (2D and 3D), simultaneous translation and multilingual audio broadcasting. Cinema La Compagnia is a venue for the annual Florence international documentary film festival, Festival dei Popoli. The Teatro Comunale di Firenze or Teatro del Maggio Musicale Fiorentino was built in the 1800s as an open-air ampitheatre seating 6,000 people! After fires, damage from WWII bombing, and other closures, it finally re-opened permanently in 1961 as a 2,000 seat auditorium. The theatre now hosts Italy’s most important music festival, the Maggio Musicale Fiorentino. Milan’s premier opera house is where Toscanini twirled his baton, Giuseppe Verdi was once the in-house composer, and Maria Callas trilled her way to fame and fortune. La Scala has been perhaps the most important opera house in the world since 1778. This is where Verdi, Bellini, Rossini, and Donizetti premiered their works—among them Norma, Nabucco, Madama Butterfly, and Aïda. Our internships are run in collaboration with the Florence University of the Arts (FUA), which will act as your headquarters during your time in Florence. You will have access to all FUA facilities as a Performing Arts Abroad intern, including the gym and culinary arts school dining hall. All buildings are in the very heart of Florence with the main student life center overlooking the Arno River. Immerse yourself in this breathtaking Renaissance city, the birthplace of opera, with its countless cafes, museums, and architectural wonders. History is alive everywhere you look, from Giotto’s Campanile and The Duomo to the Bapistery of St. John. Take advantage of the many performances throughout the city and enjoy a show in one of Florence’s historical performance halls. 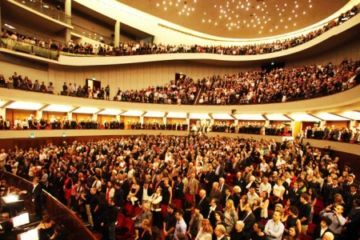 Attend one of the abundant opera and instrumental concerts throughout the city and enjoy the legacy of Italian music, including the famous two-month Maggio Florentine Musical festival in May and June. Showcasing classical theater institutions, socially progressive theater organizations, and experimental groups, Florence offers inspiration around every corner. Surrounded by style and elegance in everything from food to fashion, you’ll feel the artistic heart of Florence the minute you arrive. Enclosed by the rolling hills of Tuscany, the region’s mild climate and ample opportunities for entertainment make it a popular destination. World-famous vineyards and olive oil producers are minutes away, while the cities of Venice, Milan, and Rome are just hours away by train. During your internship, you will live with other students and interns in an apartment. Apartments are located throughout the historic city center of Florence (within the old gates) and within walking distance of 20 minutes or less to our headquarters at the university. Each apartment includes a fully equipped kitchen with a stove, a bathroom shared by no more than four students, a washing machine, a fan for the summer months, two full sets of linens for the bed, an iron and ironing board, and a set of cleaning materials. All utilities are included in the price of housing. Single rooms are available by request at an extra cost on a first come, first served basis. Italy has hot, dry summers, and mild, wet winters. Climate change means that summers are even hotter than they were, with many days over 100°F. The average temperatures in the summer are 89°F during the day and 76°F at night. In the winter it is 51°F during the day and 43°F at night. Interning at an opera house where you will sell tickets, usher for performances, assist with marketing and promotion, help translate the website and manage social media, and more. Interns with a strong background in voice may also have the opportunity to join performances. Working at a theatre to help promote shows, sell tickets, assist with load-ins for shows, manage a performance space calendar, help with social media, and more. You will be picked up from the airport with other program participants by our Site Director, Alessandro and then taken to your apartment where you will spend some time unpacking, settling in to your housing, and getting to know other students and interns who you will be living with. Alessandro will then lead a short walking tour to help you get your bearings, followed by a Welcome Meal and orientation. The following morning, you will make your way to the campus of our partner university in Florence and meet our Program Director, Cristiana. At the welcome orientation you will learn Italian customs, receive a tour of the campus and nearby parts of the city, and gain basic information about your program. You will also be shown the easiest and most efficient path to your internship. Your internship will begin within the first few days of the program, and a PAA representative will accompany you to make introductions, review tasks and goals, and help you finalize a schedule with your placement supervisor. For the first three weeks of the program, you will take an Italian class at the university in conjunction with your internship. You can plan to intern around 20 hours per week, and most interns have ample time for exploring the city and traveling around Italy and other nearby European countries. Spend anywhere from three weeks onward working with an arts organization in Florence. This is a customized arts administration internship abroad opportunity in dance, music, theatre, or film. We work with many arts organizations in Florence, and you will be placed based on your interests and background. When you apply, you will submit a cover letter that explains your goals for the program, including the arts area most interests you, and the kinds of tasks you hope to be doing. If you make it to the final stage of the application, we will conduct a Skype interview with you in which you will describe what you are willing and NOT willing to do during your internship. We will then use all of that information to make our acceptance decision and place you with the company that best fits your goals and interests. During your internship, you will learn how an international arts organization functions and experience cultural collaboration that will help you grow as an artist. In some cases, you may get the opportunity to participate in classes, rehearsals or performances depending on your Italian language level, your skill level, and the needs of the company at the time of your program. Your internship will be managed by Performing Arts Abroad in collaboration with a university in Florence. As a result, you will also enjoy the same benefits as students at the university, including access to the libraries, gym, and other amenities. My internship with St. Mark’s Opera in Florence, Italy was incredibly educational and beneficial to my development as a performer and aspiring professional in the opera world. Living in Florence was perfect for developing an understanding of the history and importance of art, the Renaissance, and both the benefits and downsides of placing so much importance on this development. Living in an Italian city was also very beneficial for learning the language and getting to know a different culture. Your availability in U.S. Eastern Time for a 30 minute video interview with your Program Coordinator. During this interview, you will schedule a Skype interview with our Internship Placement Coordinator in Florence. You will receive an acceptance decision within two weeks of finishing the application process. Be very clear in your interviews about your goals for the internship. We work hard to customize placements to your needs, and to do this well, we need a clear picture of who you are and what you want out of your experience (and don’t want!). Use the cover letter template we will send you to help organize your thoughts for the cover letter. Remember that we will be sending these to companies for consideration to take you on as an intern, so put your best foot forward! You must be 18 or over the day you begin the program. There is no language requirement for this internship, although knowledge of Italian will widen the range of placement possibilities. Note that 3 weeks of Italian language courses are included in the cost of the program. Preference is given to candidates with at least one year of experience in your chosen discipline. We are looking for open-minded, flexible applicants who can clearly convey their passion for the performing arts and an acute interest in international travel and exposure to new ideas. Explore Barcelona’s vibrant arts scene with an internship at a hand-picked organization, customized to your arts administration interests. The language of dance and movement transcend cultural borders. Find out for yourself as you collaborate with locals in Ecuador, using the power of dance for social change.